"Brother and sister on the flower meadow"
Spray varnished and ready to start puzzling! 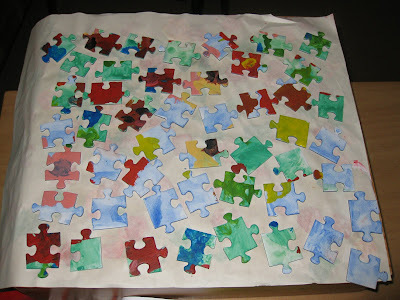 Over the years most of my young athetoid clients have loved to do jigsaw puzzles. On the other hand most, but not all, of my young diplegic clients have said : “Sorry but no they are not really for me”. Some were actually less polite and refused point blank even to have a try. 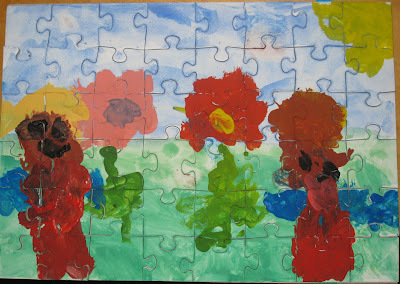 You really can’t make children enjoy jigsaw puzzles, however creative and motivating you are. They either like them or they don’t. Some may enjoy doing a puzzle as a joint activity but when left alone they loose interest. Others puzzle away to their hearts' content. 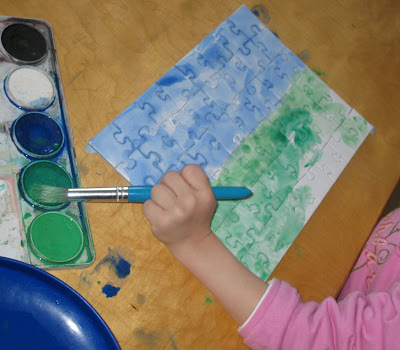 Jigsaw puzzles would be a great medium for teaching diplegic clients about turning things round as they look at them, recognising shapes, forms and spaces, matching colours, etc., but generally these children just don’t enjoy them. I have found other games that they enjoy, that serve the same purpose. For example, making treasure hunts in the garden or a more confined space, where they can hunt for and collect “hidden” objects, are always a great success. They love to take instructions differentiating between left and right, up and down, over and under, beside or below, hot and cold. 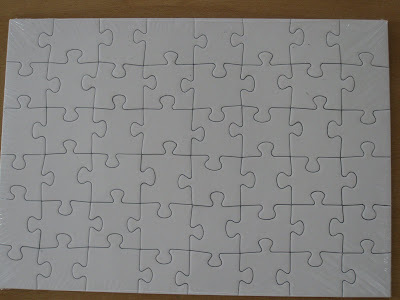 This all works wonders in improving orientation and coordination, and the jigsaw puzzles remain packed in their boxes! It really does seem to be a different story with my athetoid clients. Does anyone else notice this? In my experience these clients are so patient while doing puzzles. They find their own ways to hold the pieces, turn them, slide, lift and even shove them into the correct position. I have found that even if diplegic clients will do a puzzle with me, they have often little interest to do one alone, whereas the athetoid clients love puzzles and do all that they can to learn how they can complete one unaided. They continue wanting to do puzzles long after they have out grown the subject matter on those with suitable size pieces. My mother was an expert at finding just the right puzzle to fit every hand. She knew all about the hands and fingers of my clients, even though she was miles away in a different country. Most of my collection of puzzles was bought for me by my Mum at car boot sales! But even with my Mum always on the look-out, eventually the age-appropriate pictures always have pieces too small for fumbly athetoid fingers to handle well. We design our own of course, as can be seen in the pictures above. 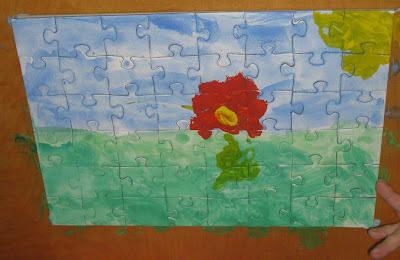 We had great fun planning and painting this new puzzle. Now it is in pieces and, after a coat of spray varnish, tomorrow we shall see how easy it is to put together again. I love observing the different ways that children do jigsaw puzzles. I love to imagine what they are thinking as they pick up pieces and turn them over and over and over, at the same rate as the thoughts seem to turn over in their heads. There are the children, usually those who have nimble fingers, who randomly pick up a piece and search for its home. Pushing and shoving and turning until it fits, oblivious to its form colour or pattern. Then there are the children with less nimble fingers who spot a hole and try to fill it. These are the children who, when they have spotted the piece that they are looking for, then decide how best to grasp it to avoid too much turning, so that it fits easily into its space.